This installment of Life in China is focused on an aspect of Chinese culture that stands as a fairly stark contrast to our American culture. Read on for a bit of insight into how the interesting people of this vast city of Shenzhen, in this vast nation of China, approach the outdoors. Specifically, we’re focusing on how Chinese women (don’t) tan. That’s right, sun tanning is a no-no here. Unlike us nutty westerners who like having a good tan, Chinese women don’t like overexposing their skin to UV rays. In fact, they go to great lengths to avoid sun. Why is that? Pale skin is deemed beautiful. We’ve heard a couple of different explanations for this, but for the time being let’s just keep it simple: pale is pretty here in Shenzhen, as well as the rest of China. One day Shon and his students went on an outdoor adventure field trip of sorts, and one of the students complained to him afterward that the SPF50 sunscreen didn’t work. “Did you get sunburned?” Shon asked, aghast. “No, look,” she said. She pulled her sock down a half inch, and there, sure enough, her skin was lighter. She had gotten a gentle tan on her legs, and she didn’t like it one bit. Shon tried to restrain his chuckles and told her he was sure that it would go away in a couple of weeks, and that nobody would notice. She was genuinely anxious about it. Truly, this seems a bit humorous to us. Not because we think Chinese folks are foolish for their perception of beauty, but because they go to great lengths to avoid even a slight tan, and that’s such a contrast from what we’re accustomed to. For example, it’s not uncommon to see a woman cover her head with a book or whatever she’s carrying if she has to cross the road and walk through the sun. Parasols or umbrellas are seen as often on sunny days as rainy ones. What’s more, women often have these amazing sun visors that look like a mix of an old-fashioned bonnet and a welder’s mask with the face shield tilted up, and that raised our eyebrows at first. However, we’ve got to admit, they’re effective at keeping pesky rays of sunlight from darkening the skin. 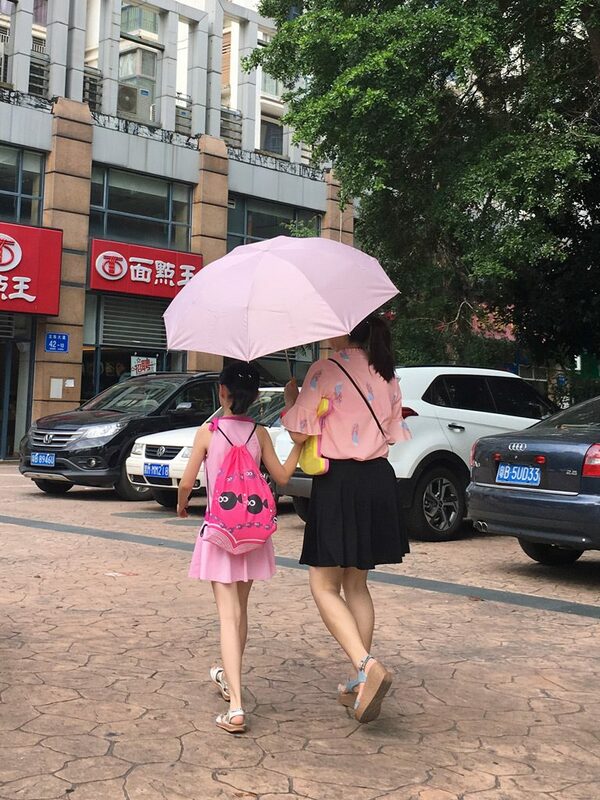 A mother and daughter walk along the sidewalk here in Shenzhen, China, parasol in hand. Besides headgear or parasols, people of all ages wear very thin jackets even in 35C-degree heat to avoid UV rays. In fact, in hot, sunny weather sometimes women will be covered head to toe, even using face masks. We also spot women wearing what looks like really long fingerless gloves that reach way past the elbow to keep their arms pale. Our little Princess was interested in this lady’s garb. This lady, for her part, was friendly to us. If you’re thinking this seems a bit extreme, well, we think so too, but let’s admit it–excessive sun is bad for us. We can’t argue that these are all good ways to avoid getting sunburned and also, in the long term, to avoid skin cancer. Yes, yes, some sun is good for us, but too much is harmful. It’s shorts weather from our perspective, with the sun behind a cloud at the moment, but the temperature is still 90F/31C, and this woman is providing us a fine example of the measures some ladies go to in order to stay white. Pale is pretty goes beyond simply avoiding a sun tan. It also applies to skin products. Whitening skin creams represent the majority of skin products on Shenzhen store shelves. It’s also not uncommon for women to use make-up in tones lighter than their actual skin tone. So, after spending the best part of a year in Shenzhen, Guangdong, China, we no longer have much reaction when we see women avoiding the sun. At first all the jackets, masks, and so forth seemed ridiculous. However, as we adjusted to living in China, we stopped thinking it weird. It is simply a part of Chinese culture. Still, it made an impression on us since it represents a vast cultural difference between China and the USA, so we wanted to write about it. As always, we’re not writing to belittle Chinese people or Chinese culture, but simply making an observation and drawing a comparison, as it is cultural differences that make living in Shenzhen, and indeed living in China, such an interesting experience. 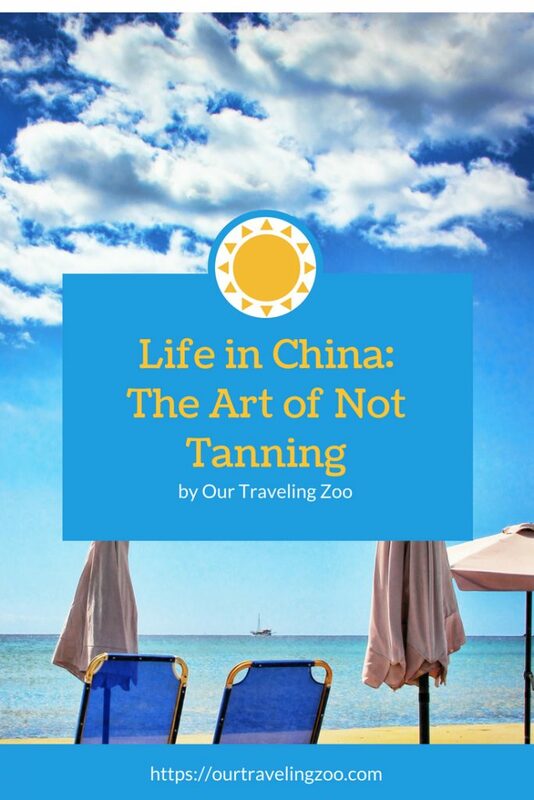 Sun tanning in China simply isn’t popular. Also, as a final note, while we were outside taking photos for this post today, we noted that roughly half of the women out and about weren’t concerned with special gear of any sort. For more Life in China, click below. Life in China: A Series. A final note: if you’ve traveled through Asia much, you’ve probably seen women taking similar measure to avoid the sun elsewhere. For sure, this isn’t exclusive to China or Chinese culture. Sharing is caring! Pin this pic! This is part of the SE Asia culture. I used to date a Filipino woman who used mango soap to bleach her skin a little bit every day. Fashion trends cycle over the years and region by region. I love this observation about Chinese culture. Yes, those skin lightening products are popular in the region! It’s neat how there are cultural differences like this, right? In Japan, it is exactly the same as in China. Being pale is good, being tanned is bad. I have very fair complexion and would love to get a little bit of a tan. But I can’t I go red and then I go white again. I am often complimented by Japanese that my skin is so beautiful pale. I do thank them for the compliment and then I usually try to explain to them that in Europe and the US being pale isn’t desirable. They are as fascinated with that idea as we are about theirs. That’s pretty neat, Lena! It’s really fun to learn about these cultural differences, isn’t it? It is always amazing to read about different cultures and beliefs. This is something new to read. I have seen the Chinese women with those scarfs and always carrying an umbrella but had no idea about their fascination with pale skin. The skin products must be making a very good deal of money. I’m glad it was something new for you to read! It’s an interesting aspect of Asian culture. I had no idea that getting some sun in China was such a big deal to women in China. Seems like the SPF clothing market would do really, really well there. Yes. There’s a whole bunch of clothing made specifically to help women avoid the sun here! Great post! 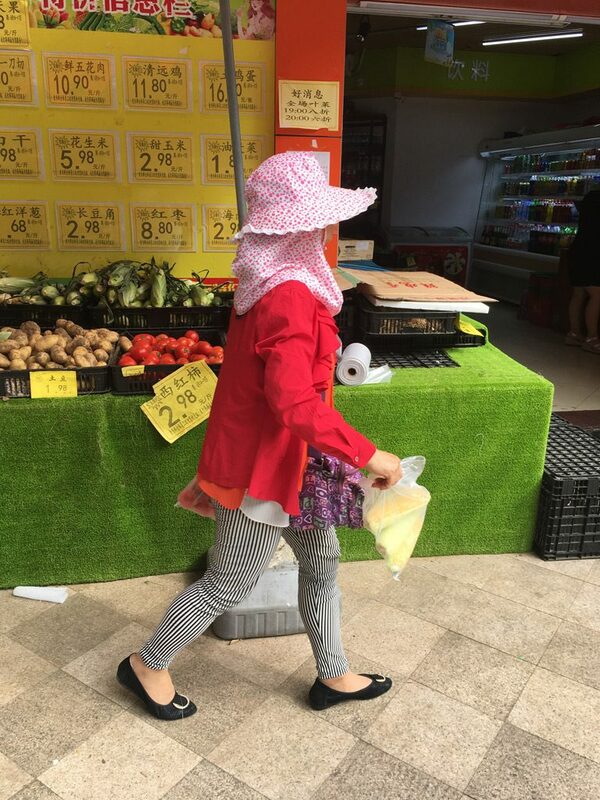 I have always wondered why women from China seem to put clothes on instead of taking it off when the temperatures rise – never knew it was a fashion thing. I thought it was about skin-cancer…thank you for making me wiser. :-) What you describe is what I love about traveling – being introduced to different customs and traditions. That’s definitely one of the best things about traveling! One the one hand, it’s very wise that they avoid the sun – it’s damaging the skin and can affect your health (although I love sunbathing!). Since that’s not the reason they are doing it – for them it’s an aesthetic issue – they damage their skin – and probably health – by using, in addition, these terrible bleach cream where they look as if they fell with their face into a bag of flour. 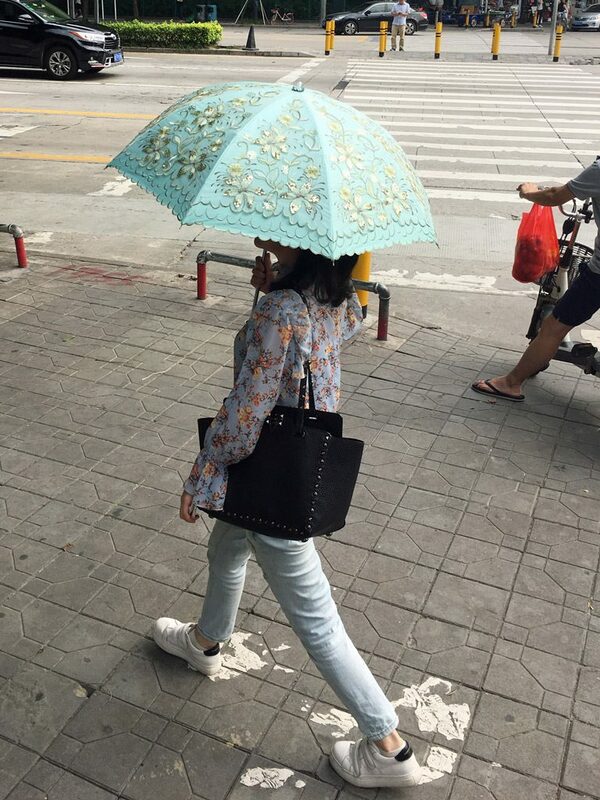 If people just stopped ruining their health out of vanity…..
It’s crazy how much they want to avoid the sun in China! It’s probably a good thing as the sun is damaging, but I always wish I was more tanned! Yeah we saw this a lot not just in China but all over Eastern Asia. The lengths these women to go are quite extreme and it’s a strange paradox to our western way of encouraging a tan. I think that just shows how we all idealised how other people look rather than just being who we are. Yeah we’ve seen this a lot not just in China but the whole of Eastern Asia. The lengths some of these women go to for whitening is scary, but then again people get cancer to tan in the west! It’s a strange paradox of always wanting to look like someone else rather than accepting who we are. What an interesting read I never knew that about Chinese women but it makes complete sense but I suppose I did not think about it before. I thik that Chinese women look beautiful with their pale skin. I know that women in India do not like to tan and go darker and when I was in New Dehli airport looking for sunscreen I struggled to get one that didn’t allow you to tan. I think that the skin color doesn’t matter, really, but there’s no question that there are some lovely, pale women here. So India is the same? Totally true, this happens all over Asia. When i was travelling in Cambodia i was with a friend of mine that is very white. Many people were envious about that! Thanks for the comment, Sheree! Glad it brought back some memories! I hope your sunburn heals up quickly!